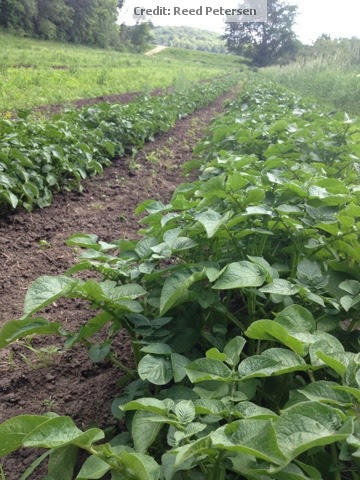 We will start harvesting baby potatoes this week. The plants have been blooming and that portends the harvest. Our customers like the potatoes small so that is our mission. We pick fresh every week. We will have two varieties, Yukon Gold and Dark Red Norland. Both are exceptionally early and have excellent flavor. If the season was earlier, we have sometimes planted a blue potato so we could have red, white and blue potatoes for the July 4th weekend. We typically battle against the evil Colorado Potato Beetle. We had very severe cold in December before we had snow cover and I moved the potatoes to a different field. So guess what, no potato bugs in the potatoes this year. The rows are unblemished and nearly picture perfect. These voracious little buggers will eat every single green thing on a potato plant, leaves, stems and even the potatoes under ground. So it is nice to have a break from them this year. There are some very good organic controls for these, without chemicals. I have had conventional growers ask about how I handle these and they have switched to the organic method, good for them. I’ll save this for a future post. We plant a new crop every 3 weeks for a continuous supply. We are going to plant our last planting next week. We keep the seed potatoes in the cooler at a dormant temperature until we plant. That keeps sprouting to a minimum. Occasionally, when we plant a whole seed potato the original seed potato is so well preserved by the plant that you could still eat it or use it to start a new plant. No wrinkles and no decay, even when it has been in the ground several months. If a seed potato had a bruise or soft spot the earth worms will move in a clean out this decayed spot, but leave the healthy part of the potato alone. We find perfectly cleaned out little pockets where this happens, but the rest of the potato is firm and healthy. Good job Mr. Earthworm. Potatoes grown from seed potatoes are not really seed at all but a clone of the original parent plant. Potatoes do bear seed from a mother and father, and these are used in the development of new varieties. Tomatoes can be grafted on to the roots of a potato plant. There are close cousins in the Solenacea botanical family. If you grafted this way you can get potatoes and tomatoes from the same plant. No, I haven’t tried this. This is more of a curiousity than a commercial practicality. Despite the freaky nature of our blog name (designed to help you remember it), I don’t go much for freaky vegetable combinations.